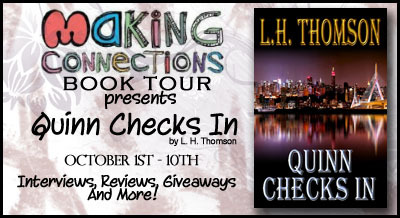 Welcome to my stop on the Making Connections Blog Tour for Quinn Checks In. 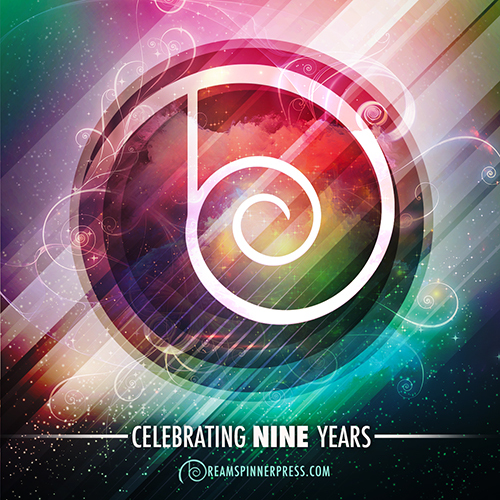 Enjoy the two excerpts I have for you below! Liam Quinn is back in his hometown Philly after three years in the pen for forgery. Now the ex-boxer, ex-art student has been given a chance to make amends by working as an insurance investigator, restoring a little of his family’s pride and getting another chance at Nora Garcia de Soria, the woman of his dreams. 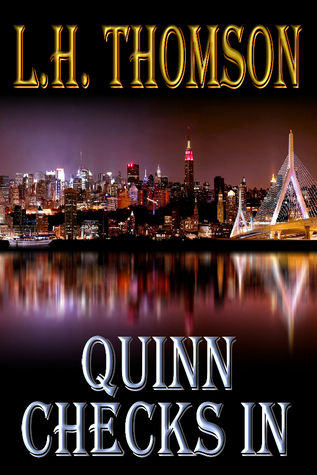 But a gallery heist isn’t what it seems, and pretty soon, Quinn is running out of people to trust. The biggest mobster in town, a sweetheart named “Vin The Shin,” is calling him out; a steady string of lowlifes want his head, and the local police think he’s hiding something. Hey, when trouble comes knocking? That’s when Quinn Checks In. “Here is a PI story that doesn’t deal in death, that doesn’t reflect just black-and-white, and that makes you wonder where the Quinn series is going to go. I for one, certainly plan to find out, and have booked a copy of the next Quinn already. Oh, and not to mention: there’s a little dash of romance as well, that keeps you wondering about how it will develop as the series continues. “Liam dodges bullets, punches… okay, some not so much, mob-types, and all sorts of lovely women in this bright, witty and wonderfully complex first in the Liam Quinn mystery series. IN ART, THE ARC OF A CURVE can be a beautiful and important thing. In Art Deco, for example, the consistency of its curves gives each design a sense of cleanliness and function, of uniformity. When I was an art forger, a perfect curve was one of my best friends. So believe me when I say that the arc of the pool cue slicing through the air towards my head was a thing of beauty, a mighty cut that in that split second, with Boston’s classic rocker “Smoking” cranking on the jukebox in the corner, made me wonder why the giant biker swinging it had opted for a life of vice and violence, instead of baseball. I ducked, dropping between the two tree-trunk arms around my chest, and the pool cue continued its arc. If he’d swung with a tighter reach, instead of stepping into it so directly, he’d have come up short and gone over my head while still missing his enormous bald-and-goateed companion. But then it wouldn’t have been perfect. Instead, the cue smashed into his buddy’s temple with a hollow clack, like a brick dropped on hard cement. MY FAMILY’S NEIGHBORHOOD is called Fishtown, and it’s about as glamorous as the name sounds. The narrow old brick-and-wood buildings are attached, block on block, crammed together tight, tall and skinny, dark hues and wood shingle siding. Many of them are multi-family and still others – like my parents’ house – were just the most that young immigrant families could ever hope to afford back in the day. The streets between them are no wider than modern alleys, decades of beaten down, repaired and patched asphalt worn to a near-glassy smoothness in the occasional spot. The neighborhood has been filled for years by the ranks of the blue-collar working man: firefighters, cops, dock workers, construction workers, garbage men, mailmen, teachers and transit drivers, all crammed in with their wives and husbands and kids and grandparents, like shoes stored in a box one size too small, then piled on top of one another in a corner cupboard. Nearly everyone here is Irish, or Italian or Russian. But everyone displays their Star Spangled Banner in some prominent spot on their house and means it, too. Every person here, no matter how well off they’ve been, has a father or a grandfather who’s willing to smack them silly still, and sit them down and lecture them about life in the old country, and how good they’ve got it now. In summer, when the mercury climbs high, the humidity swelters and the sidewalk feels like it might melt, the close quarters can boil over into trouble, with nowhere good for all of that pressure to go, long-time next-door neighbors coming to rapid blows in short, unsustainable explosions of passion. But more usually, you see the best in people, a kind of hum of activity as they blow off that steam, of guys in football jerseys and long shorts swapping stories on the stoops while sharing a tall boy, and kids playing in the street, hanging around Central Pizza for a slice or a hoagie, maybe cooling off under an open hydrant; it’s a real village in the city, if you come from here. Even though it’s gotten a little more upscale in recent years, with musicians and artists enjoying the affordability, people have thought of Fishtown as low-rent for years. But that’s fine with us. When you lived here, you at least knew who your neighbors were. My parents, Al and Maureen, raised five kids in one of the those tiny houses, with my dad walking a beat for twenty years and manning a precinct desk job for another ten after that. A 20-year veteran newspaper reporter and editor, L.H. Thomson has written seven novels. When he’s not writing strange newspaper and web columns about the impacts of neuroscience on sociology or the losing ways of his beloved Toronto FC, he lives in Edmonton, Canada with his wife Lori – a quality assurance manager for a major utility company who helped develop the Liam Quinn character – and their six adopted pets, who didn’t make the process any easier at all.